The centre-back has been outstanding for Saints in their four-game winning league run, during which time the Perth backline that he leads hasn’t conceded a single goal. And at Easter Road on Saturday he also came up with a last minute winner to beat Hibs. 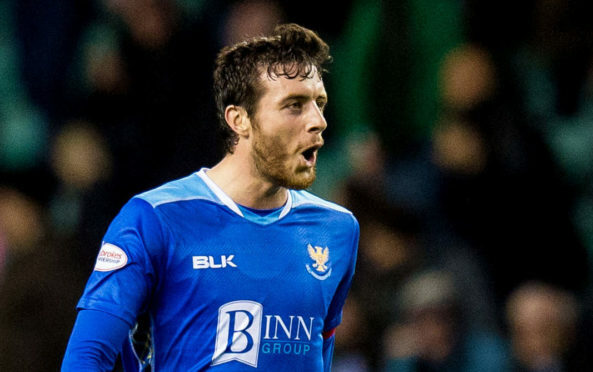 The former Aberdeen defender wants to extend his stay at McDiarmid Park and the feeling is mutual for his manager. “It was good to hear Joe saying he’s happy here and would like to stay,” said Wright. “We have a number of players whose contracts are up at the end of the season. “The chairman and I are always talking and making plans for the future, so it’s something we will be addressing soon. “My job is to recommend the players we want to keep. Sometimes the situations are different with various individuals. “There will be players who we move on early and others who we wait a while. That may suit some of them anyway. “In Joe’s case, he has been one of my best signings. “He has really grown into the team here since we signed him from Aberdeen and I think he’s also grown into the captaincy well too. Wright added: “I think he could score more goals for us because of the way he can attack the ball. “I have been delighted with him in the three years he’s been here. He has played nearly every minute of every game he’s been available for since he arrived. Tony Watt’s goals were crucial for Saints in the early weeks of the season but it is his all-round game that is helping the cause at the moment. Wright said: “Even though Tony hasn’t scored recently, his work rate and his link-up play have been superb. “There has been a maturity about his performances for us. He’s enjoying the role he’s playing for the team. “I think it says everything that in the last three games when he’s come off he’s had a standing ovation from the supporters. “They have really taken to him and he has really taken to the club. With Hamilton Accies coming to Perth this weekend, Saints will be favourites to make it five wins on the bounce. “Four clean sheets and four wins in a row was the perfect response to the Celtic defeat,” said Wright. “But nobody here will be getting ahead of themselves. “I know people will now be looking at us and expecting us to beat Hamilton, but we don’t see it like that. “We have plenty of respect for them. Every year people tip them to go down and they make them look daft. “Martin (Canning) is a very good manager. They got a great result at the weekend.